What nobler employment, or more valuable to the state, than that of the man who instructs the rising generation. Today is National Teacher’s Day and not a moment too soon. However most people probably don’t know or care that it is. Teachers are not valued highly in our society. They used to be but not anymore. Ask a teacher how they feel about classroom conditions, support from the elected officials on school boards that use their office to attack the institutions that they have been elected to serve. Ask any teacher about the effects of the “No Child Left Behind” on their ability to teach and be able to reach out to students that learn differently from the rote memory exercises needed to pass a standardized test. Higher education likewise is being gutted the formerly amazing California State University System, and the California Junior College system which I attended is being decimated. Professors have not competitive wages in years, programs are being cut while tuition is increased. I attended San Joaquin Delta College and paid $5 a semester plus books. I averaged $200 a year at Cal State Northridge. Programs were amazing, class sizes good, professors and instructors, excellent. That system and many others are in crisis. You see teachers, especially those in Public Schools have for the last 30 years or so, ever since Howard Jarvis’s Proposition 13 passed in California and gutted educational spending the target of right wing pundits, politicians and preachers. They are blamed by some people for almost every ill in the educational system. If teachers complain or take their case to the media they are made the villain. In most States they don’t make a lot of money for all the education, training and certifications that they are required to have to teach. They have few protections and those that they do have, mainly in the protections that they gained through their participation in organized labor are being stripped away in state after state. When I was a kid growing up in the 1960s and 1970s my dad was in the Navy. It was a turbulent time for our family. Due my dad’s transfers as well as a school boundary change in one district I ended up attending six different elementary schools in three states, three schools in three states in 4th grade alone. During that time our lives were in a constant state of flux and as a grade school student it was my teachers that helped me get through that time. Because of the transfers I didn’t get to have the opportunity to remain in a community long enough to get established until Junior High School. I was always “the new kid in town.” Not that that is bad or that I have any bad memories of that childhood. I found the new places, people and schools to be a grand adventure. In fact when my dad retired from the Navy I was not happy. I wanted him to stay in because I liked the adventure. I remember every one of my elementary school teachers names, save one in 4th grade where were we not at the school long. There was the strict Kindergarten teacher, Mrs Brandenburg who made sure that she write with my right hand. To this day my handwriting is illegible but who cares now when I type everything. Then there was my 1st Grade Teacher at Oak Harbor Elementary School, Mrs Christian. She was a sweetheart her husband was an airline pilot and in 1st grade, probably because of my handwriting I was tested for some learning difficulties. I guess that there was nothing wrong because that didn’t last long. In Second Grade I had Mrs Jackson. Then in 3rd grade a new school was opened and I attended Olympic View Elementary School. My 3rd Grade Teacher was Mrs King. It was in 3rd grade that I really began my adventure in reading. I devoured every book in the biography and history section that I could find in the Library, especially those dealing with military and political leaders, sports figures (especially baseball players) and military history. I began 4th Grade at Olympic View but my dad was transferred to a travel intensive assignment in Long Beach California in the fall of 1968. I had my first male teacher at Olympic View, Mr Alguire who I really liked. We moved to Long Beach and it was a difficult move. there were a number of deaths and serious illnesses in the extended family and I attended Robert E Lee Elementary in Long Beach for just a few weeks before my dad had my mom, brother and I go live with my Grandparents in Huntington West Virginia. We arrived there in early December and I found that I was out of my element. My teacher at Miller Elementary was Mrs Gates. She was very tough and I was hammered with more homework than I had ever seen. I was also the “new kid” and since we had just moved from Long Beach a “city slicker” and was challenged to a fight in my first week. It was a draw. However Mrs Gates was a great teacher and I continued to read, write well but illegibly and learn to speak in front of the class. When the school year was done we moved back to Long Beach when in a different neighborhood just across the cement lined San Gabriel River from Orange County I attended Hawaiian Gardens Elementary School where I met my friend Chris Brockel who I have managed to stay in contact over the years. That was probably my most fun year in school. I was asked if I wanted to skip 5th grade but I told the principle that I wanted to remain in my 5th Grade Class. My teacher was another gem, Mr Oliver. It was a great school year combined with the fact that my dad was always taking us to California Angeles baseball games. But dad received orders to the elderly Aircraft Carrier USS Hancock CVA-19 home ported in Alameda California at the end of that school year which made another move necessary and initially thought had ruined my life. heck I had baseball, Disneyland and Knott’s Berry Farm, the Queen Mary and Sea World. I saw my first professional hockey and basketball games and it was a dream life. Since it was the early 1970s and the Bay Area was in turmoil and I had a great Aunt in Stockton we moved to Stockton just down the street from her. In Stockton I attended Grover Cleveland Elementary School and had the woman that I think was my best teacher of elementary school Mrs Dietrich. My dad was underway or deployed most of the time between 1971 and 1974 when he retired. That first year was hard and like my other teachers Mrs Dietrich was a rock of stability who encouraged me to learn and think for myself. I attended Stockton Junior High and Edison High School and there are were teachers at every grade level who I remember fondly. My French Teacher from 7th-9th Grade was Mrs Milhousen who was very patient with me. My history teacher was Mr Silvaggio who my brother would later teach on the same faculty in his first teaching assignment. I remember my Printing Shop and Wood Shop teachers, back then you had to become familiar with trade skills as well as academics. I learned to play the French Horn in band class which was taught by Mr Hull. At Edison I still remember great teachers like Gloria Nomura, Mr Riley, Mr Oji, all who taught History or Social Studies, Donovan Cummings my Speech teacher, Coaches Charlie Washington, Vick Berg, Duke Pasquini. There were others but two of the most important were my Naval Junior ROTC instructors LCDR James Breedlove and Senior Chief Petty Officer John Ness. I could go on and on about teacher. That continued in college and seminary. I am indebted to the wonderful, gifted and dedicated men and women that were my teachers. My mom was a teacher’s aid when life settled down in Stockton when dad left the Navy and retired from the school district. Likewise my brother Jeff is a teacher and in administration at an alternative school in the district, his wife is an elementary school teacher. I now have a BA and three graduate degrees. I am indebted to my teachers and cannot forget them. Teaching is hard. I have taught a couple of undergraduate level Western Civilization classes and the amount of work is enormous. When I hear the Unholy Trinity of Right Wing Politicians, Pundits and Preachers that beat up public school teachers at every opportunity. School Board members who seem to be more interested in political careers than education and those that hack away at programs that cater to the whole person I am disgusted. When I went to school those things that made me what I am today, the library, the gym classes, athletic programs, the foreign languages, art, music, speech, and things like shop were required. They helped give me an appreciation for the world and for people in general. They helped make me a more rounded person. From what I see now those kind of programs are being decimated and our kids will be poorer for it. This is not the fault of the teachers. They work with the crap being forced on them by politicians in Congress, statehouses and on school boards with ever shrinking resources and always increasing requirements. We need to actually care about our teachers and educational systems. Policy and budget priorities set by politicians coupled with parents that are either bullies or absentee are the reason our schools are in trouble. I hate to lecture but teachers matter. Education policy matters. Educational funding matters. If we want to be competitive in the world we need to make education a priority again and start giving teachers some measure of respect and stop using them as a straw man to divert attention from the real causes of our educational crisis. Today is National Teacher’s Day. 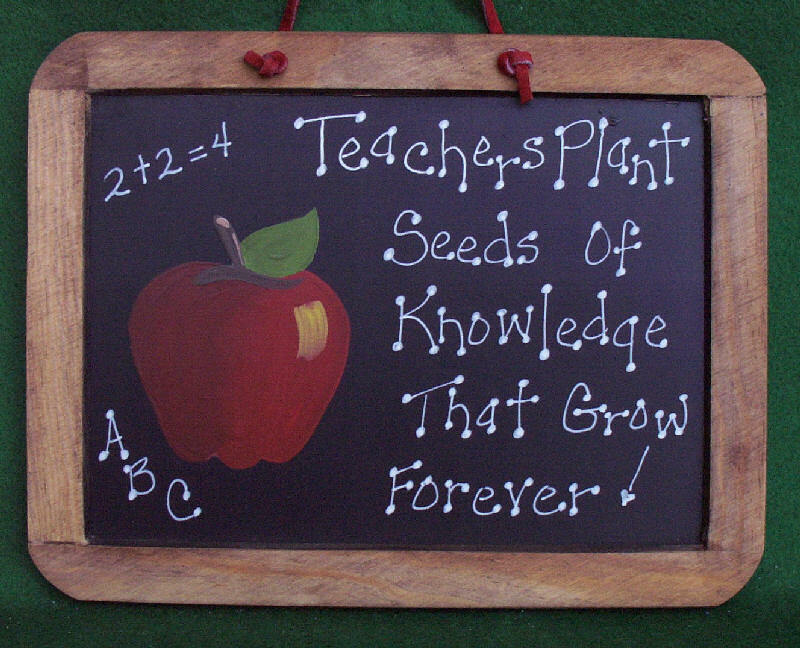 Admittedly it is after hours but take some time in the next few days to thank a teacher. If you don’t have kids, go back and thank one of your own.